It’s not often I post about the shop, however this month I have something very exciting happening! If you’ve seen my shop you’ll have seen the odd sheet of stickers drawn by my talented other half, Ed. Over the past few weeks he’s dedicated a lot of time to creating sets of beautiful hand drawn images. I’ve then turned these into sheets of super cute planner stickers! They’re being released in themed sets, with the first two hitting the shop today: entertainment, and food & drink. The next sets are coming Friday the 25th and will be health & fitness and happy mail! They’re all sized with flexibility of planners in mind. I wanted people to be able to use them no matter their planner. From a Hobonichi to an Erin Condren these stickers should suit all. Each listing will have a picture of the sticker in a Happy Planner to give you an idea of size. I’ve created a section just for hand drawn stickers here so you can keep an eye out what’s being released. Today I wanted to give you a first look at this week’s new stickers! I’ve called this selection entertainment but it’s not just about electronics, with the range featuring reading and walking stickers. A personal favourite in this range is the film night stickers, that have little stars you can colour in so you can review each film you watch! Because these are matt vinyl, most pens will work to colour in the stars, but I like using my fineliners to do it. I also fell in love with the walking stickers as soon as Ed completed them. My favourite parts are the little animals in them. This will definitely be an expanding range, so if there are any stickers you’d like to see in it, please drop me a message! The best thing about taking pictures of each of these in a planner means I get to keep the rest of the sheets for myself! I absolutely ADORE the coffee cups. Although they do kind of make me want to buy more takeaway coffees than I really should… I love the subtle smiles in these stickers. The ones on the grocery bags in particular make me happy. If you follow me on Instagram you’ll have no doubt seen a few sneaks of these over the weeks! They’re also another way to get an idea of size and how to use them in your planner. I’ve also been using some of next week’s releases so it’s definitely worth a follow if you want to see what’s coming up. I hope you all love these stickers as much as I do! While I’d love to be able to draw this skillfully myself, it’s great to be working with Ed on this project. If you fancy giving him a follow on Instagram where he does sometimes post what he’s working on, you can find him @pinnipedfriendo. 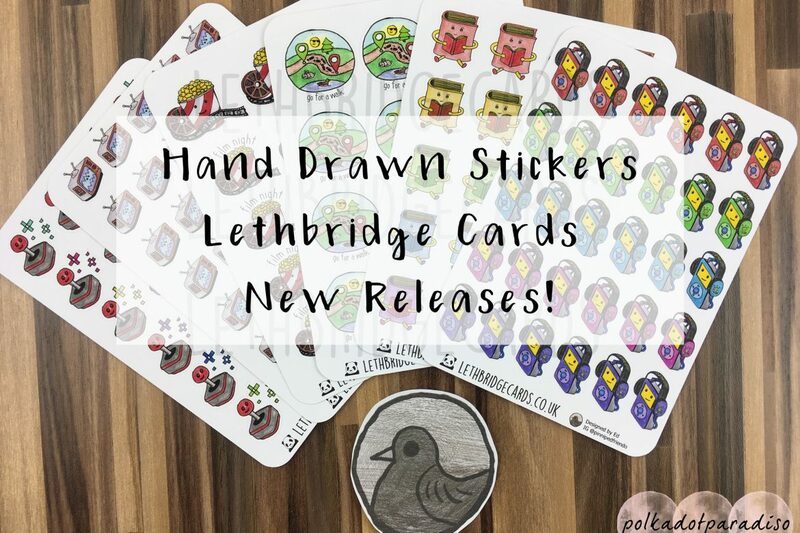 Fridays are now new release day at Lethbridge Cards! If there’s any stickers you’d like to see in the shop, please drop me a message on Etsy.